As our Members of Congress return home this week for August recess, they are being met by the voices of many interest groups trying to influence the course of health reform legislation. Some of these voices are industry lobbyists who want to protect their own particular piece of the health care pie. Others are activists looking out for their particular cause or issue. Amidst this noise, it can be difficult to remember that this debate is about our health, and that our elected officials are charged with listening to, and looking out for, the millions of everyday Americans who need the security of knowing that they and their families can afford to get the quality health care they need when they need it. 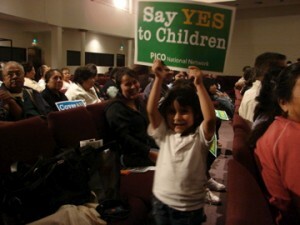 Our children and our families are not special interests. This is why thousands of PICO grassroots clergy and faith leaders across the country are organizing a nationwide Faith-Based Day of Action for Health Reform on Tuesday, August 11. We want to make sure that our voices – the voices of everyday Americans, are not drowned out in the debate. The campaign will include coordinated same-day Prayer Vigils and Press Conferences in cities and towns across the country that will reach 100+ Members of Congress with a strong pro-health care reform message. Together with faith allies, we will also launch a new TV Ad featuring PICO pastors and people of faith that will be aired on national cable television. Attend a Prayer Vigil in Your Community! With the future of health care reform legislation on the line during the August Congressional recess, we need your voices – those of everyday Americans – to break through the noise, and send a clear message to our Members of Congress that the majority want to see Congress pass legislation this fall that makes quality health care affordable for all.